Since Mark has been posting on the woes of the Big 2 automakers based in Michigan, I thought I would share some interesting statistics. Much is said about labor rates in the U.S. compared to China and other countries, but there are some challenges right here within the 50 states as well. Michigan, home to a high percentage of autoworkers and the worst state in terms of non-ag employment growth, has not suprisingly the highest average manufacturing wage. That's good for the state, but the problem is that it is far above the norm. To demonstrate, take a look at the histogram below (click on it for a larger image) . 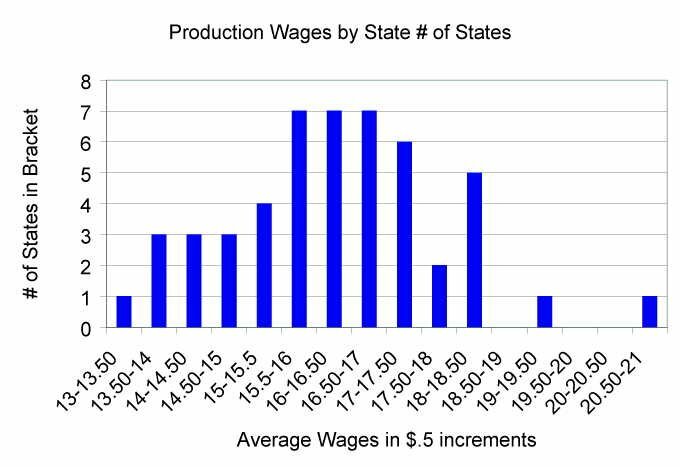 It is the average production/manufacturing wage for states with the # of states falling into each $0.50 bucket. It's not quite a normal distribution, but it's pretty close. But there is one lonely outlier all the way to the right – you guessed it, Michigan. At $20.87, it is almost $2/hour higher than the 2nd highest, Louisiana. The lowest, if you are curious, is Alaska. To be fair, I'm not saying this is the problem, nor am I offering any solutions. I'm just providing the facts, which I believe are important for the debate about what to do about segment-specific competitiveness issues. This number wouldn't be so bad if Michigan's value-added production per worker was also the highest. Unfortunately, Michigan ranks 22nd there. That number is much more complicated, affected by everything from productivity to the price of the products you make. Interesting post. I found it particularly intersesting as I am originally from Michigan and now heavily involved with China. At least Michigan is better than France, right? Excellent, thought-provoking post. I find the similarities between the elites in places like India, China, Russia, Korea, and the United States, fascinating. It is almost as though all are of one country and the difference between countries lies only in the “non-internationalized” portions. For that reason, I agree with your conclusion that the distinctions will be between the haves and the have nots and to that extent the world is getting flatter. Thanks for the comments. The world is getting flatter in many respects, and in other cases economies are very localized. The main reasons for this is skill and organization concentration. There is a reason that many Japanese and European companies have technical centers in Michigan – that’s where the engineers and supplier and R&D resources are. The same way Rochester is a center-of-gravity for optics, or Milan for fashion, or LA for entertainment, and so on.